I recently changed my main Twitter client (more information on that below) and decided to create a poll in my LinkedIn Group to find out what others use. I asked my 2,500 group members: What Twitter client do you use for business? 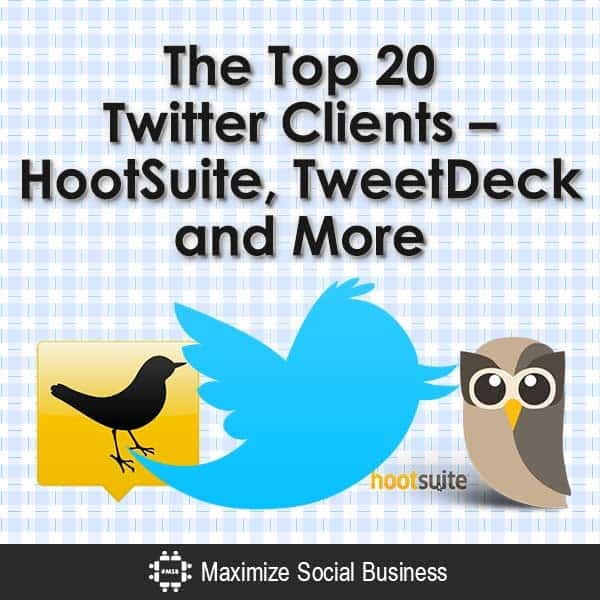 Statistically speaking, the results can not represent the entire user base for those who tweet, and I only gave the poll readers a choice between 5 popular clients: Twitter.com, HootSuite, TweetDeck, CoTweet, and SproutSocial. The leading client in the poll as I write this blog? SproutSocial. I am assuming that Cibo pulled in this data directly from the Twitter API, so I believe these results are a good enough sampling to be pretty indicative as to the top 20 Twitter clients at the time of writing this post. Chances are you are using one of these, but with the changing social media landscape and your potentially shifting objectives and ways in which you and your business use social media, I thought it was a good idea to do a short review of the top clients in hopes that you might want to try a client or app you may have never heard of before. 1. HootSuite is a web-based social media dashboard designed to manage a whole slew of social media platforms above and beyond Twitter — Facebook, Linkedin, and have even begun limited support for Google+ — and multiple social profiles in one interface. It also offers the ability to produce reports based on custom analytics to better track brand awareness, follower growth and other pertinent demographic data. Initially built for internal agency use, we can now say that HootSuite is the most popular Twitter client today. 2. The “web” entry refers to those who send out a tweet from Twitter.com, which underwent improvements and now sports a new interface, is still a relatively simple and elegant approach to tweeting, searching and discovering. If your business only has one account for tweeting, Twitter.com is still an option, and even if you use other clients listed here, you still might be finding yourself coming back here on occasion. 5. Facebook features the ability to sync one’s Twitter account to his or her Facebook page. This allows your Facebook posts to be automatically tweeted and retweeted on your Twitter account. I’m personally usually not a big fan of cross-posting from one social media website to another, where hashtags mean nothing and the @FacebookUsername don’t translate to @TwitterUsername. 6. The Tweet Button is a small widget that can be embedded into websites (such as online magazines and news sites, including this blog) which gives viewers and readers the ability to share articles of interest to their followers. It is fascinating to see the amount of sharing of content that internet users do on Twitter. This means that if your website doesn’t have a Tweet Button, you’re missing out! 7. Twitter for iPhone is the official app that is compatible and can be downloaded to an iPhone, iPad or an iPod touch powered by at least iOS 4 or later. Twitter developed this application by purchasing the creators of the best client for the iPhone at the time: Tweetie. 8. CoTweet is a social media management tool that allows teams to manage one or more Twitter accounts by offering such capabilities as tweet assignments, notes, and on duty status. Similar to a HootSuite or a TweetDeck, I praised the “archive” functionality in CoTweet and announced that it was one of my Top Twitter Applications in a recent blog post. However, CoTweet’s parent company, email marketing software company ExactTarget, announced just recently that the free edition of CoTweet will no longer operate after February 15, 2012. While ExactTarget will be releasing a new social media management dashboard called SocialEngage to replace it, I have already switched to a new client (keep reading!). 9. Twitter for Mac is a desktop application designed specifically for the Mac. It is a sister app to the official iPhone and iPad apps that was originally known as Tweetie. Amazing how many Mac users are also heavy tweeters! This product has evolved into the current TweetDeck for Mac app. 10. The web service dlvr.it allows bloggers to publish, distribute and syndicate their content across various social media platforms. Dlvr.it has become popular recently as a TwitterFeed replacement in that it gives you more robust filtering and analytical capabilities. Once again, though, this is a platform for automation. 11. Paper.li enables people to publish online newspapers based on twitter topics — stories and articles — that they like, giving their readers fresh news daily, automatically, like a personalized broadcast. If you thought you’ve been seeing a lot of Paper.li tweets recently, you’re not alone. As a source of tweets Paper.li is now a huge player, and it will be interesting to see if this trend continues – and how it evolves. 12. Originally known as Tweet Later, offering the ability to back then a cutting edge way of scheduling your tweets to post in the future, SocialOomph is a service, both free and paid, that offers productivity solutions for social media users. Among its many features are the ability to manage many accounts, post scheduling and blog integration. I know many Internet marketers who are still heavy users of SocialOomph, but I don’t know how many enterprises have adopted them. 13. I was happily surprised to see another app that I regularly use and highly recommend, Buffer, make it to the top 20 Twitter clients. Buffer offers a smarter way to schedule your tweets. Plan out all your tweets for a particular day, fill up your Buffer with your desired tweets, then Buffer schedules them for you. While not a true client per say, Buffer is a perfect complement to help you schedule your posting on Twitter and on their recently added support for Facebook. 14. Tweetie for Mac was designed originally for the iPhone and later made available for desktop, but after being bought out it is only available now as the official Twitter client. I assume that these are the diehard Tweetie users who have yet to upgrade to the “official” client for whatever reason, but this obviously isn’t an option anymore for you or your business. 15. Echofon is a client that this available for iPhone, Mac, Windows, and Firefox. It has the ability to automatically sync unread tweets between a computer, and iPhone and other devices. While Echofon has always been a popular Twitter client for the iPhone, it now supports browser and PC environments as well. I was honestly surprised to see it make the top 20, but apparently a lot of you out there are using them! 16. Twitter for Blackberry is the official app specifically for use in Blackberry handsets. 17. Twitter for iPad is another official app that was developed after the release of the iPad and is a sister application to the official iPhone and Mac apps. 18. MarketMeSuite is a social media tool and software created for social media marketing and management. Its creators aim is to turn one’s followers into customers via better online engagement. Unfortunately this tool is no longer available…. 19. SproutSocial is another social media management tool for Twitter and Facebook, but this one offers contact management, competitive insight, lead generation and more unique functionality. Since SproutSocial also had the killer archive feature I was looking for, and was also available for the iPhone, I switched over to using SproutSocial as my main social media client and am not looking back. If you haven’t, sign up for a free SproutSocial trial – and discover what you might be missing! 20. The web service bit.ly is a tool that helps collect, organize and shorten links and URLs. It is available via web or mobile. Many users use the bit.ly bookmarklet to easily create tweets with shortened links which they can then analyze the results for later. For any business that tweets, however, they are undoubtedly using Facebook and are looking for a cross platform social media dashboard. Those 5 clients in bold above are what you should be investigating if you are looking for a new Twitter dashboard to use. I find that active tweeters often have very deep and passionate relationships with their social media apps, so now it’s your turn: What do you use for your Twitter client and recommend to the world? Any surprises in the above results? Can’t believe Tweetbot is not in the top 20. Perhaps Tweetbot made the Top 30, but the data speaks for itself! No mention of TweetBot. Nice work. They didn’t show up in the list! Yes – looking forward to it Tammy! As the chart shows, those really are the two big “gorillas” in the market right now. I suggest you try other tools until you find the one that matches your needs! Tweetbot is probably the best twitter app for iPhone I’ve used so far. Unfortunately Seesmic didn’t make it into the Top 20! Certainly Seesmic is one of the first platforms, and with their acquisition of Ping.fm, have promise. Time will tell to see if they can truly differentiate their product from the others. The problem with the top 3 cross-platform clients, HootSuite, TweetDeck and SocialOomph, is that its still hard to manage your followers, even tho they make tweeting a breeze. In Tweetdeck and HootSuite you can’t even see your followers easily, so you need another tool. I do like TweetDeck because Twitter made it their free native client for ‘power users’ and I think they will keep developing it until it is as good as the best competitors clients – it doesn’t have as many features right now, but it is nice to use (HootSuite I find terrible). How long can it be til they add a buffer function, which several other apps have? SocialOomph has all the bells and whistles, but to get all the features, its too pricey for me (~$40pcm). My favourite client so far is Pluggio which you should definitely check out. I use the free version, again the full version is not cheap. But even the free version has been great for helping me find lots of targeted followers, and the interface is the most intuitive of the bunch by far. It allows scheduling, buffering, url shorteners, RSS feeds, and has its own bookmarklet for easy tweeting. I will certainly check out Sprout Social, altho I don’t really feel the need yet to pay for a client as there are so many free services available out there. For managing followers, you should definitely check out my app of choice, Tweepi! TweetSpinner is also another option. Thanks for the continued support Neal! When I first saw the tweet above, I meant to mention to you (but it slipped my mind) – Sprout Social is the only tool on that list that doesn’t have a free version – thus not surprised by the volume breakdown – the top 3 have millions of free users. Pound for pound amongst professionals I think we’ve got something specials. Thanks again for including us! Appreciate your taking the time to comment here, Justyn. That alone says a lot about your company. 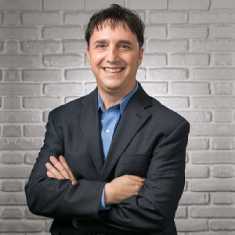 In social media tools, it truly is becoming the case of you get what you pay for, and I believe those that use social as part of their marketing infrastructure will begin to realize that $20, $50, or even $100 is a small price to pay to support their social media “engine.” Keep up the great work! MarketMeSuite is my fav for a number of reasons.. I have my top Social Media sites for clients all in one place. I can tweet to multiple accounts in one shot and can check followers, unfollow and set up various searches and so much more. There are still pieces to come on the new web app. I wrote a blog article about MMS and did a short interview with their CEO Tammy Kahn Fennell.. Thanks Elaine for spreading the MMS love at TroolSocial! Appreciate the extra info Elaine. I am still looking for what differentiates it from the others … guess I’ll have to take it for a test drive to find out! So have you tried it out yet? Thanks for including MarketMeSuite on the list. We just released our new web app “The Social Inbox” and I’d love to show you around. Thanks for commenting Tammy – and I’d love to take you up on your offer! Hootsuite keeps me sane. Nice to see @Bufferapp also listed in the Top 20! I’ve tried almost all of these and at the moment, using Hootsuite as the main Twitter management tool. I spice it up from time to time with Marketmesuite and tweet here and there with some other tools, but at the moment Hootsuite is definitely my main tool, including iPhone and iPad apps. Oh, I didn’t ignore Seesmic at all – they didn’t appear in the data! Yes, Seesmic is a good platform – but the data suggests that they may be losing out in popularity for various reasons. When Twitter released new versions of TweetDeck for the desktop and iPhone, the company must have figured that the app needed to go on a features and capabilities diet. I’ve already switched to HootSuite for mobile; I’m hanging on to the last good “Air” version of TweetDeck until I can find a suitable replacement. Thanks, Neal, for this survey. Yes, I do believe that TweetDeck has lost the leading market share that it used to have due to HootSuite adding the features that social media marketers want. As Twitter continues to integrate TweetDeck functionality, it will be interesting to see how TweetDeck can continue to maintain share. Interesting and informative, particularly as I am thinking of changing to HooySuite, the information was very timely. Sprout Social also has a very responsive support team. Any questions you have, they get back within a couple hours. So far I’ve been happy with Sprout Social support as well!